Your smile and self-confidence are valuable assets. But as you age, they can be severely compromised by tooth decay, tooth loss, and the health and psychological problems that often accompany major dental issues. This useful guide offers a unique solution that can help ease your dental distress with a non-removable solution, and give you a radiant smile backed up by studies showing some of the longest term full-arch documented success rates seen. In Teeth Tomorrow, Dr. Michael Tischler and Dr. Claudia Patch explore in clear, comprehensive detail one of the most important advances in modern dentistry: the implant-supported zirconia bridge. 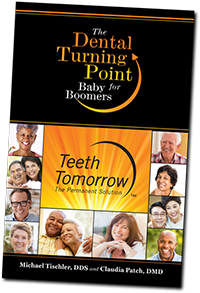 The essential information they provide will enable you to fully understand this groundbreaking procedure, compare it to other tooth-replacement options, find the best team of dental professionals, and ultimately improve your quality of life. If you’re ready to eat without pain, speak without embarrassment, and smile confidently again, the time to invest in your dental health is now. Read Teeth Tomorrow today. Michael Tischler, DDS, is the implant editor for Dentistry Today Magazine. He is a nationally recognized lecturer and author on implant dentistry, serving as the implant director of the Teeth Tomorrow Dental Laboratory as well as the founder of the Teeth Tomorrow Franchise Network. Claudia Patch, DMD, has received multiple awards for her contributions to the field, including the prestigious American Academy of Esthetic Dentistry Merit Award in 2009. She has been recognized as one of the Top Twenty-Five Women in Dentistry by Dental Products Report, a popular and influential industry publication.